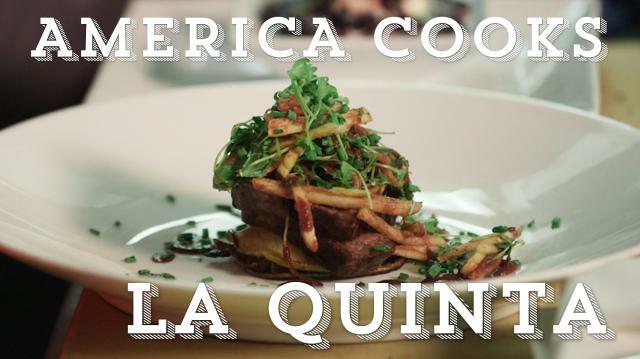 On this episode of America Cooks with Chefs, contestant Jordan heads to the California desert to learn healthy & sustainable cooking with Chef Jimmy Schmidt at the La Quinta Resort and Spa. Make the filling: In a non stick skillet melt 1 tablespoon of the butter over medium high heat.Add the shallots cooking until opaque, about 2 minutes. Add half of the green apple scraps cooking until tender, about 3 minutes. Add half of the mushrooms cooking until browned, about 4 minutes.Remove from the heat.Transfer to a food processor and pulse until chopped coarse.Add Parmesan just to combine.Adjust the seasonings with salt and pepper. Reserve for the stuffing. Make the Ravioli: In a large non stick skillet, melt 1 tablespoon of butter.Lay the slices of green apple into the hot pan without overlapping.Sprinkle the tops with a little of the sugar.Cook until slightly browned and caramelized. Turn over for only 1 minute so they are cooked, tender but not falling apart. Transfer to parchment paper (atop a cookie sheet) again without overlapping.Repeat with the remaining slices.Finally add the remaining green apple scraps with 1 tablespoon of the sugar until well caramelized.Transfer to the blender and reserve. Spoon 1 tablespoon of the filling in the center of 12 apple slices.Lay the remaining apple slices across the filling to form “ravioli”.Reserve until ready to serve. Make the emulsion: In a medium saucepan combine the Pinot Noir and 1/4 cup of honey.Bring to a simmer over high heat, cooking until reduced to coat the back of a spoon, about 10 minutes. In the high speed blender with the cooked green apple, add the raw Honey Crisp apple scraps and the vinegar.Puree until smooth.While running, drizzle in the Pinot Noir reduction and porcini oil until emulsified.Adjust the seasonings with salt, pepper and additional wine if necessary. To Serve: In an oven proof skillet over high heat, sear the beef using a drop or two of oil. Turn the beef over and transfer to a preheated 400 degree oven, cooking until your desired degree of doneness, about 4 minutes for Medium-Rare.Simultaneously, place the ravioli on the top shelf cooking until thoroughly heated.Remove from the oven when done. Meanwhile, in a medium bowl combine the remaining sliced raw mushrooms, the julienne of both raw apples, the micro arugula and half of the chives.Add the emulsion to coat the salad as necessary.Adjust the seasoning again with salt and pepper. Transfer 2 ravioli to the center of each large, warm plate.Slice the tenderloins, divide and lay atop the ravioli.Spoon a little emulsion over and around the ravioli.Position the salad atop the ravioli.Sprinkle with the chives.Serve. Start with about a 8 inch tartlet or spring form pan for the cake.Cut a piece of parchment into a circle to fit the bottom of the pan.Place the parchment in the bottom and butter both the parchment and the sides of the pan. In the top of a double boiler over simmering water, melt the chocolate with the butter until smooth.Remove from the heat and transfer to a medium size bowl.Whisk in the egg yolks then the Splenda and salt.Whip the egg whites to firm peaks and transfer on top of the batter. Sift the cocoa powder over the egg whites and fold until smooth.Spoon the batter into the pan up to 1/4 inch from the top edge.Place the pans on a cookie sheet for easy handling.Position on the lower rack of the oven and bake until the batter begins to rise to the top and the center seems firm yet still moist, about 12 minutes.Remove from the oven and drop the pan slightly on the counter top to deflate the air.Allow to rest for 5 minutes to solidify. To Serve: Unmold the cake from the pan,Divide into 8 and position each to the center of the serving plate.Divide and scoop the ice cream,positioningin the center of the warm tart.In a small bowl combine the berries and the Ginger Liquor.Artistically arrange the berries across the top of the ice cream and tart.Sprinkle with the mint and serve.